A shooting and a wedding on the same day a year apart: 1 October survivors Todd and Oshia live to say `I do’. In defiance of a day when fifty-eight people lost their lives and hundreds more were wounded, including the groom, 1 October survivors and Tahiti Village guests Todd Wienke and Oshia Collins-Waters are marrying this Monday in Las Vegas, on the first anniversary of the worst mass shooting in U.S. history, also in Las Vegas. The reception occurs in the evening at Tahiti Village in the intimate Kahiko Room. Step onto the patio and in the distance, shrouded by palm trees, you can see the towers of Mandalay Bay, where a gunman on the 32nd floor reigned down automatic weapon fire for approximately eight minutes on a crowd of concertgoers across the street. The proximity isn’t lost on Todd and Oshia, but it holds no power over them, never once made them consider a different location. Now, a year later, following an interval marked by group therapy sessions, doctor visits for Todd and emotional ups and downs highlighted by a marriage proposal, they find themselves reconciling the darkest day of their lives with one of the happiest. Country music fans from California City, Calif., Todd and Oshia were staying at Tahiti Village for the Route 91 Harvest festival less than three miles away. Todd was shot once in the left lower back shielding Oshia as they lay on the ground; once under the left arm as they fled their location near the stage; and once more on the left side during their desperate dash for cover. Weeks prior to the concert Todd had planned to propose on Dec. 12, 2017, the fifth anniversary of the day he met Oshia. But if the 1 October tragedy taught him anything, it’s that another day is never guaranteed. Back home in California after the shooting, Todd proposed 12 days later on Oct. 13, 2017 (a Friday the 13th). “We survived this tragedy together and I never wanted us to be apart,” he said. “For twelve days following the concert I had many thoughts, feelings, and concerns. None of those changed the fact that I wanted to marry her. On Friday, October 13, we went to dinner with the person who drove to pick Oshia up after the shooting and her husband. Todd, a State of California Department of Corrections sergeant, describes Tahiti Village as his go-to place in Las Vegas. He recuperated here for three days after he was discharged from the hospital the morning after the shooting, the doctors determining his injuries were not severe enough to warrant a longer stay. Oshia is a front and back office medical assistant for Aventura Health in California City. Todd and Oshia discuss their 1 October experience and wedding on the one-year anniversary of the tragedy. Their wedding weekend marks the fifth time the couple has visited Las Vegas since the tragedy. That initial return visit, over Thanksgiving, was the most difficult. “We had hoped to see the crosses at the Welcome to Las Vegas sign, but they had already taken them down,” Todd said, recalling their first visit. They have also visited the memorial and remembrance garden in downtown Las Vegas. Between family, friends and approximately 15 survivors who are making their first visit to Las Vegas since the shooting, the couple is expecting more than 90 guests for the wedding. For those who can’t make the Monday wedding because of conflicting work schedules, Todd and Oshia are holding a special Sunday pre-reception just for them. In the year since the shooting, life has begun to slowly find its natural rhythm, and the couple has once again settled into a familiar routine. Certain triggers can still elicit an emotional response that take them right back to 1 October. For Oshia, it is sudden loud noises and fireworks. 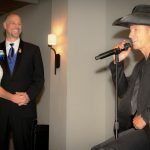 For Todd, it was the occasion of his Medal of Valor ceremony at the California Department of Corrections, a portion of which included video of Jason Aldean singing at the Route 91 Harvest festival. The footage shows Aldean finishing his set opener, “Any Ol’ Barstool,” just as the first burst of gunfire sounds. No one paid it much attention, Todd said, thinking it was fireworks or an isolated incident on the Strip. When a second volley of gunfire goes off as Aldean starts his second song, “When She Says Baby,” there is no doubt what is happening. For Todd, that future included three bullet wounds and a run for his and Oshia’s life as he ushered her and two wounded women out of the venue to safety. We at Tahiti Village are honored that Todd and Oshia are holding their reception with us, and we wish them many years of happiness as they make new and joyful memories in their life together.